I have been called many names. Some were nicknames. Names like … Why, Way, Biscuit, Lil Bill, Knowledge Knot, Boss, Schoolboy, Usi and Shy. Some were titles. Some were aliases. No, I’m not telling you those (I was using an alias for a reason!). Sometimes it was people mispronouncing my actual name. Some were adjectives. Some I embraced and accepted. Some I shunned and/or rebelled against. There are a few that I’ve done both with. One of those words is: SILLY. How do you get water in the watermelon? Plant it in the spring! Why was the boy covered in gift wrap? HaHaHa … that was funny to me! Ok … not laugh out loud funny, but … I liked the joke. Ok, call me sensitive, an over-thinker or whatever you want, but honestly, the joke spoke to something deeper in me. I liked the fact that a corny joke reminded me to stay in the moment and sparked the idea that if we stay in the moment, we are the gifts. I am not sure if this was the original intent for Jerome B from Norfolk, VA, but I thank him for it. It felt like this was a reminder that these vessels, called bodies, that hold our spirits are the presents that we share with the world … while simultaneously our bodies are a gift that the universe has shared with us. Thank you Laffy Taffy wisdom … aka … I think too much … aka sometimes I make it deeper than it really is. GOOD ONE. REALLY GOT ME. Great post!!! I love corny jokes. it’s the best kind of joke, in my opinion. Speaking of . . . What do you call a midget (little person), Genie who’s on the run from the law? A small medium at large! LOL!!! 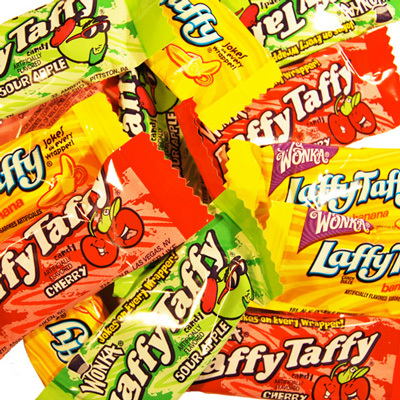 What you do with Laffy Taffy’s, I do with money. I like to tuck money into my winter coat pockets or unused purses, so I get a little treat when it is time to break them out again. Ugggh! I need an edit button. It’s a psychic, not a genie! Womp womp!